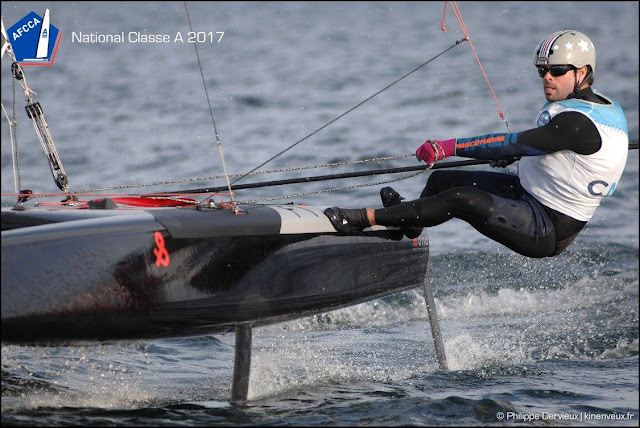 All images by Philippe Dervieux / Kineveux.fr - Full gallery at French Assoc fb - Lake Maubuisson is a great place to sail & race A-Cats, just perfect indeed for foiling or floating mode. 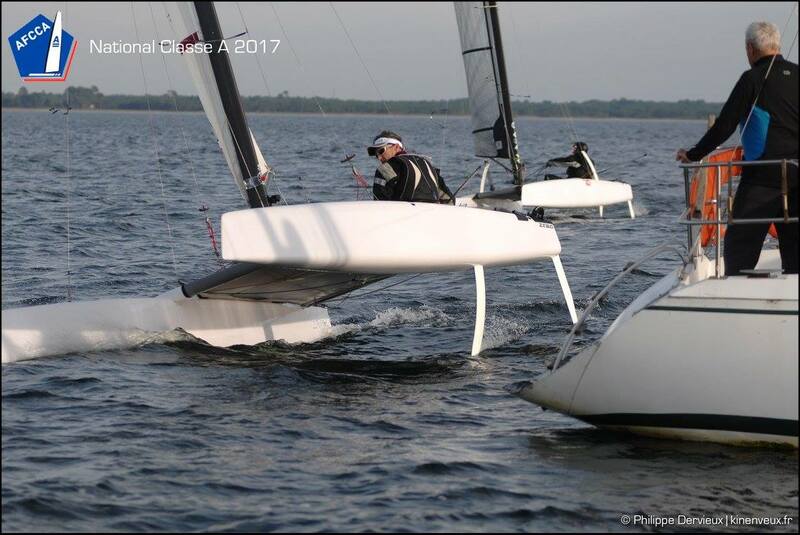 We had a blast in 2014 with a group of Arg sailors. 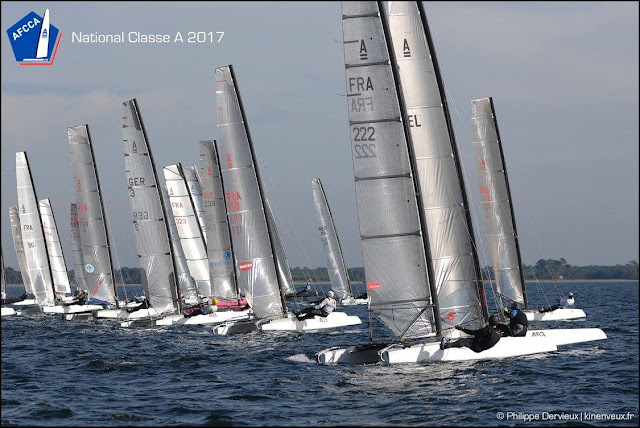 The French Assoc is holding their 2017 Nats at the same 2014 Europeans venue. Nice to see our friend Thibault Laudren (A15) leading after 2 races. Top 3 spots shared with other two usual local contenders , Emmanuel Dodé (F1) & Jean Louis Le Coq (D3). 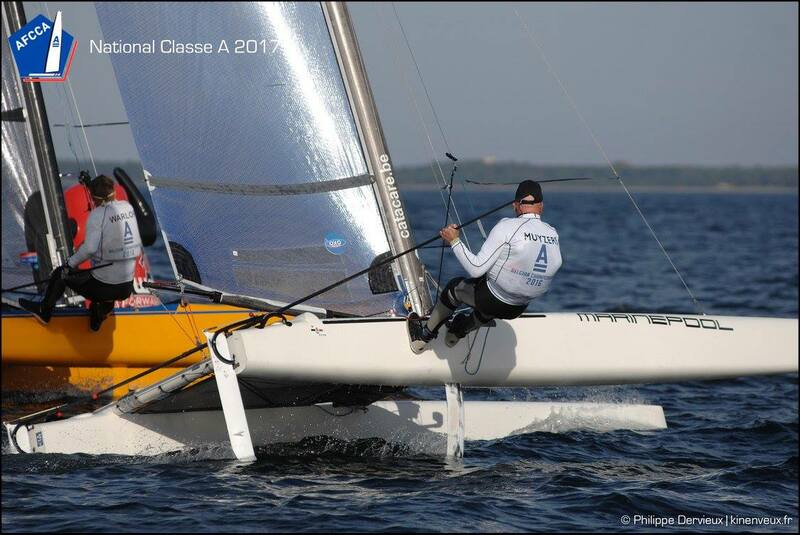 Excellent nrs of participants at Bordeaux, 44 A-Cats , mixing foilers & classics divisions in one fleet. F18 top gun Patrick Demesmaeker is racing these Nats too. 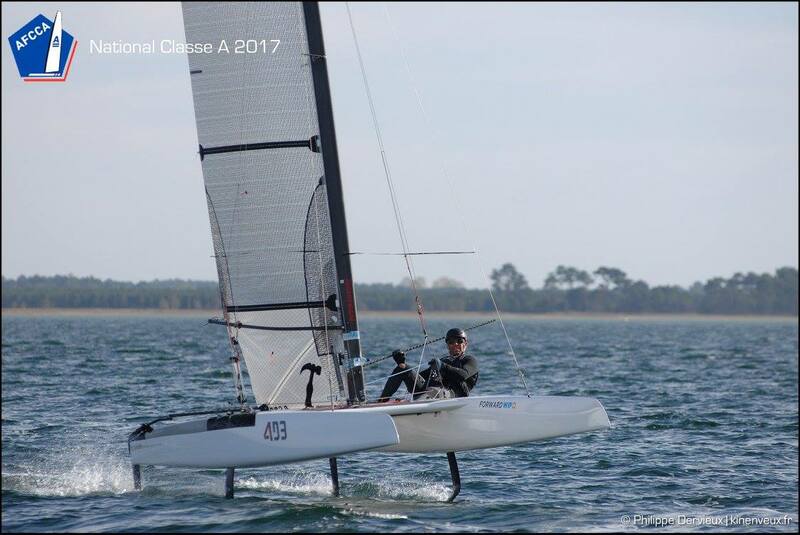 If you have the chance to sail both classes just go for it, you wont regret it. Below Day 1 report sent by Thibo. "This 2017 Nationals is organized by the Cercle de la Voile de Bordeaux, on the Lake of Maubuisson. Same spot than 2014 Europeans. 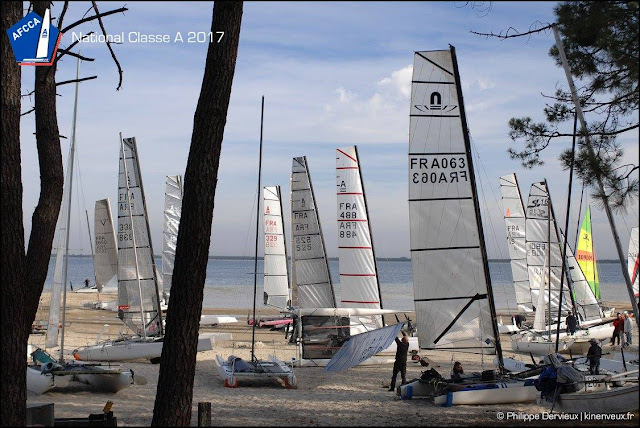 Holding now this event at the end of the French A Cat season seems to have find great interest with 49 boats who have registered with sailors who have come a long way from Germany, Switzerland, Belgium, Spain and the Netherlands. First day saw 2 races in a sunny 8 to 12 knots breeze with the usual Maubuisson gusts, making the racing as much a tactical game than a speed contest with flat water great for high-speed foiling or typical classic boothery style when going downwind. Emmanuel Dodé won the first race, Thibault Laudren ranked second and Jean-Louis Le Coq third. The same trio lead the second race with Laudren ahead this time around, Emmanuel Dodé second and Jean-Louis Le Coq scoring another third. On the general ranking, Laudren is leading with equal point to Dodé and Le Coq third. Micky Todd, Albert Roturier and André Casanova are the top 3 in the Classic division. Tomorrow forecasts are for light winds, with certainly little foiling opportunity. That will potentially shuffle the general ranking and see the classics smile at the end of the day !"